Biolite - Fire to Phone Charging (Lesson 6) | CE - Clean Energy. Bright Futures. This is the 6th part in the Off the Grid Unit. This lesson continues to look at the efficiency of USB charging devices, but this time we will be using a commercially available camping stove that uses heat to create electricity in order to charge a phone. 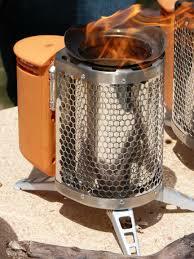 This is the Biolite stove that exploits the Peltier Junction in order to generate an electrical current. Students can also attempt to measure power output of the stove by taking data on the heating of water. This is a demonstration activity, as the whole class will be using one stove and recording data into their science journals.